We offer the best Tours & Transfers in the Dominican Republic tourism industry today. We serve thousands of clients every year and we would love to help you enjoy quality and reliable services that will for sure make turn your holidays into a memorable experience. Please find our range of services below. We offer you the most reliable door to door private transfers all around the Dominican Republic in order to help you reach your destinations. 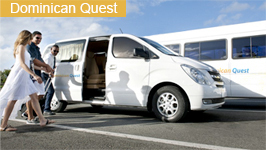 Enjoy comfort and peace of mind by booking all your transfers with Dominican Quest. Whether you are looking for the best Dominican Airport Transfers or the safest ride to travel between your destinations we have got you back! We pride ourself for punctuality and highest customer satisfaction. Friendly and professional drivers along with a top-nocht monitoring service from our offices in order to handle logistics will ensure your transfers are a true success. We are very confident that you will like our quality tours in the Dominican Republic. Whether you are staying in Puna Cana or the beatiful Samana Peninsula we have the right activity just for you. You will love the expertise and professionalism of our tour guides and specially their dedication to make you happy. Simply choose one of our group tours by browsing our offers or request a customized tour which we may schedule upon your requests. We will strive to exceed your expectations. Visti the most beatiful places in our countty with Dominican Quest. We specialise ourselves in arranging private flights and charter services to and from any location in the Dominican Republic. We safety in mind first, we will help you travel the long distances that separate tourist destinations such as Punta Cana and Puerto Planta among others. Feel free to send us your request today, tell us how many passengers would like to travel and how much luggage you would be carrying. We will answer your query in the blink of an eye. We have a number of different aircraft types and options to fit your travel needs and help you to fly where you want when you want.